If you have missing teeth, there are several ways to replace them. A fixed dental bridge can replace one to three missing teeth. 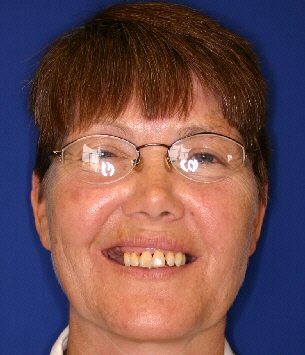 It is anchored permanently onto the teeth adjacent to the space of the missing teeth. A dental implant is a post that is anchored into the bone. It takes the place of the root of the missing tooth, and then a dental crown or bridge is placed over that. One tooth or multiple teeth can be replaced. The most economical way to replace several missing teeth is with a removable partial denture. 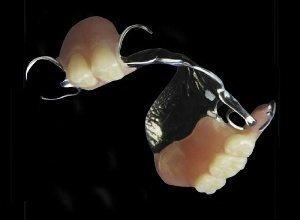 There are many types of these appliances, from the very inexpensive dental flipper, to precision attachment partials. 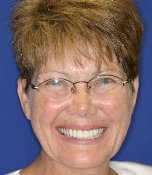 Not only is a removable partial less expensive than a fixed bridge, but with a partial the dentist can replace many teeth with one appliance. If there are three or more teeth in a row that need to be replaced, or if you do not have sound teeth on both sides of the empty space, a dental bridge will not work well, and your options are more limited. 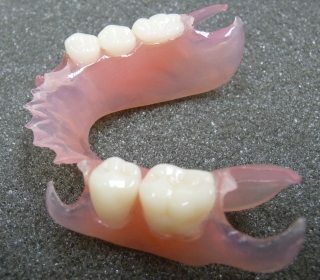 Here is a sample partial denture case done by Dr. Blaine McLaughlin of Cedar Rapids, Iowa. In the hands of a competent cosmetic dentist, a removable appliance can be made quite esthetic. Terri had crowns in the front and a partial to replace her back teeth. On the left is an illustration of a typical removable partial denture. Traditionally they have had a metal framework that clips onto the teeth. For an additional expense, clasps can also be hidden behind the teeth to improve the appearance. Partials can also be made entirely of plastic materials. The Valplast partial is made of pink plastic, with the clasps appearing translucent. While not as durable as a partial with a metal framework, it can be much more esthetic in situations where the clasps would show. The disadvantages are that this may not be as esthetic as a bridge. Clasps will be required to retain the removable partial, and it may not be possible or practical to entirely conceal those. However “precision attachment” partials, which are more expensive, conceal the clasps very effectively. And, many dentists are now having laboratories make partial dentures completely out of plastic, with clear or pink clasps that aren’t very noticeable. Another disadvantage of the removable appliance is that there is usually some discomfort with wearing hardware in your mouth, and it is not as stable as a bridge or an implant.